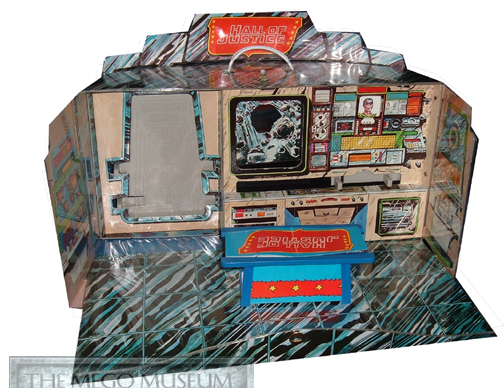 This is one of the finer playset/display pieces you can add to your collection. The heroes just look terrific inside of it. 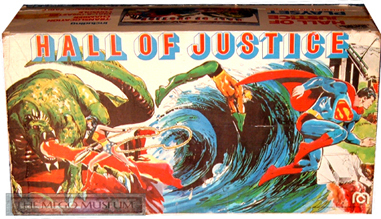 It was produced in 1976 and was featured on the back of the Teen Titan card that was made the same year. 1976 was a great year for Megos. 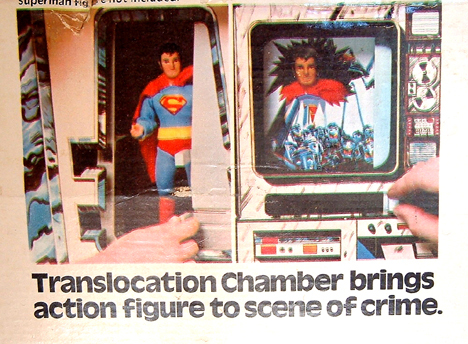 The gimmick with the HOJ is the Translocation Chamber and Dial-a-Disater Console. You put your hero in the chamber, as young Timmy on the box there is doing. You slide the door closed, and when you reopen it the hero has disappeared. He (or she) reappears behind the disaster screen that Batman is pointing to below. 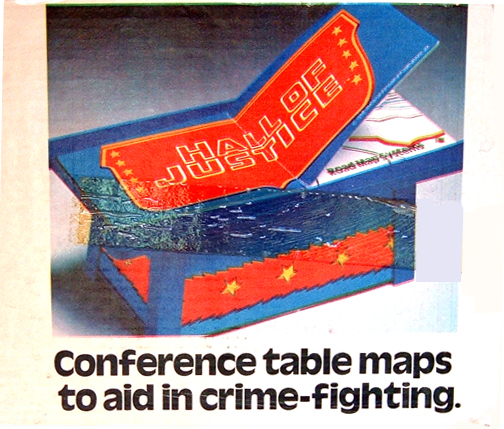 By sliding the levers along the console you can change the "scene of the disaster", which is essentially a thin piece of plexiglas with disaster graphics affixed to it. The hole in the middle of the graphic reveals the Hero in a classic newsman head shot. As marvelous as this all sounds, it must be said that the mechanisms that operate this wizardry are pretty dodgy. It has a crude, clunky motion, and once the screens get off track it's very tough to realign it. If we get a good explanation of how to do so, I'll let you know. Mine doesn't work so good. But it LOOKS GREAT! The graphics on the outside of the box are stunning. Classic Neal Adams style. The HOJ is also a heartbreaking TEASE. It shows Green Lantern on the back and also features Lex Luthor on the interior. Shades of things to come that never were. What ELSE were they planning? The window in the back is...an odd choice. It is probably there so light peeks in on the hero in the disaster scene, but on the outside it's interfering with some cool stuff. All of these photos were provided by George Munoz. Thanks for the great shots, George!